ROMBALL is an entirely fresh project that just recently came online (at the moment when I'm writing this review project is online just six days). Starting from the first day administrator of it decided to list his project among the strongest projects of our industry that are located in the Golden Stage listing. For now, this program is very fresh, and that is why I think that there is an excellent chance to make a profit from it. Even I'm not a big enthusiast when investment project returns initial deposit at the end of investment term I must say that this time I like investment plans that ROMBALL offers because daily yield is quite modest. Administration provides you with an opportunity to invest in investment term starting from 15 up to 90 calendar days. Of course, it will not be possible to spend 30 dollars on 90 day-long investment plan, but only on the shortest one. Smaller investment amount you will have - after shorter time you will receive back your initial deposit. It is positive because there is no chance that no one will sink this project if someone invests for example 10 000 dollars in first (shortest) investment plan. Plans are simple, easy to understand, and that just demonstrates that project could survive for some period. Project from a design point of view is quite attractive, but when we take a look at the inside of it, I must say that we have seen such member area already countless times already. I'm not saying that immediately there is a need to change everything of the inside, but if someone is already scammed in similar looking HYIP than he will not deposit money inside this one. Of course, that is just my two cents here, and I hope that project will do well. In any case, as usually I recommend to deposit only your free funds because we never know when this project will stop. By the way - below you will be able to read quick questions & answers part with the administrator and at least personally I recommend to check it out! Investment plans: 1.20% daily for 15 calendar days, initial deposit returned at the end of the investment term. 1.70% daily for 30 calendar days, initial deposit returned at the end of the investment term. 2.00% daily for 45 calendar days, initial deposit returned at the end of the investment term. 2.40% daily for 60 calendar days, initial deposit returned at the end of the investment term. 2.80% daily for 75 calendar days, initial deposit returned at the end of the investment term. 3.30% daily for 90 calendar days, initial deposit returned at the end of the investment term. 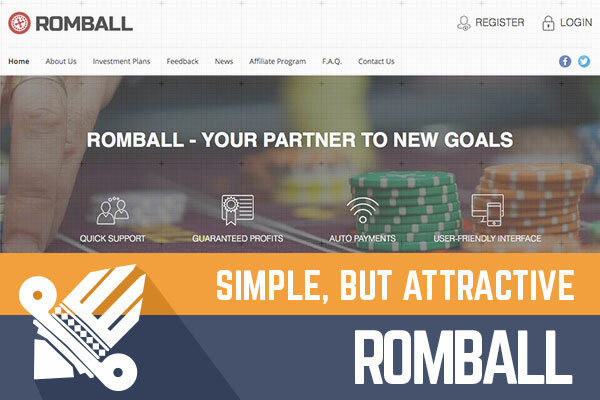 ROMBALL is an investment company that provides investors with reliable profits based on roulette gambling. We have been investing in roulette gambling techniques for over 10 years now and we are a big team of highly skilled investors. Opening our company to the public is a big move for our team and it is also our first public venture but we took all the necessary steps to make sure our investors have a 100% safe and reliable environment for their investments. Our goal is very simple: we want to make more money and we will do it using investors’ money and sharing a part of our profits with them. - How safe is a script that your project use and how safe is the server that your project is? We are running on a modified H-Scrip script, which is one of the safest options in the industry, and we decided to go for it after an extensive research. Our programming team also checked this script and included extra safety routines. We also have SSL protection inside all our pages and we are running on a dedicated server with DDoS protection from DDoS Guard, a very popular and classical solution for financial businesses. Safety was one of our main concerns when bringing ROMBALL to the public and our investors have nothing to worry about it. Extensive testing has been carried out to flag any possible flaws in our system and I'm confident to say our system is nearly uncheckable. David News is a reference in terms of online investment and we put it on our top list of monitors since you have been around for a very long time. Choosing the highest class type of listing in you it is the way we found to recognize your hard work and, also, to show our investor base that we are willing to use solid and stablished monitors to prove we are here to stick and that we are a solid business. I honestly did not know about David News before deciding to open ROMBALL to the public but we spent a considerable amount of time browsing it and decided that it is among the best and most mentioned rating systems online so I'm confident this is the beginning of a powerful partnership. 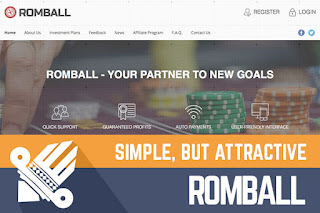 ROMBALL is very clear and simple about all its activities and I would recommend users to read our terms of service and FAQ before making an investment, doing that will give them a good grasp of what we do and they will feel confident to become a part of us. I would also like to reinforce that we have a support team ready to deal with any kind of requests and we will be happy to assist investors from anywhere in the world through the entire process of opening an account and making a deposit. We invested a lot of effort, time and money to bring ROMBALL online and that includes research, legal paperwork, planning, programming, design, marketing, putting up a support team and stablishing a process for our activities and a logistic plan for our cash flow and, for all that, we are certainly going to remain online for an undefined amount of time. Being online is a win-win situation for us and our investors because being online means access to larger sums of investment money, which gives us larger profits, our ultimate goal. I know the world is full of false promises but I also believe that it is clear that we put a lot of effort into bringing and running ROMBALL and our plans for it are just huge. We want to achieve standards this industry has never seen before and we are 100% capable of doing so, our business model is scalable and you’ll be hearing a lot from us in the future. Thank you for interviewing us! If you're trying to BUY bitcoins online, PAXFUL is the best source for bitcoins as it allows buying bitcoins by 100's of payment methods, such as MoneyGram, Western Union, PayPal, Credit Cards and they even allow exchanging your gift cards for bitcoins.